A Los Angeles judge has ruled that Lindsay Lohan's friend, Samantha Ronson, can question celebrity blogger Perez Hilton about his report that she planted cocaine found in the actress's car after a crash. The judge ruled Ronson's attorneys can take a four-hour deposition from Hilton. Hilton - whose real name is Mario Lavandeira - was sued for defamation after he repeated a report that first appeared on the Web site CelebrityBabylon.com. 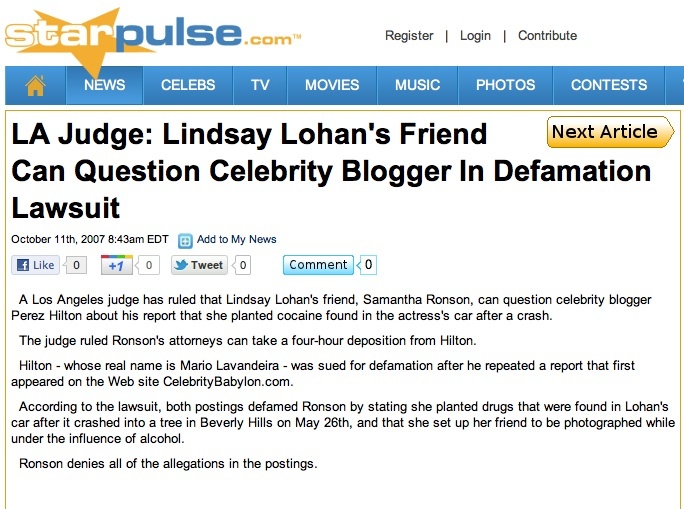 According to the lawsuit, both postings defamed Ronson by stating she planted drugs that were found in Lohan's car after it crashed into a tree in Beverly Hills on May 26th, and that she set up her friend to be photographed while under the influence of alcohol. Ronson denies all of the allegations in the postings.